To clear a certain pattern of bits, you do a similar masking operation, but using the AND function instead. If you AND a bit with zero, it will clear it to zero regardless of what the bit was before, while ANDing with one will leave the bit unchanged. So, to take the same example above and clear the middle six bits, we AND with the reverse bit mask, 111000000111. This is shown in Table 15 and illustrated in Figure 10. 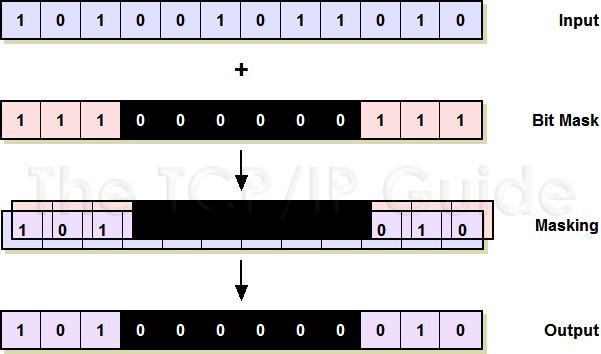 This diagram shows how a bit mask can be used to clear certain bits in a binary number while preserving others. The mask shown here can be likened to a painters mask; each 1 represents a transparent area that keeps the corresponding input bit value, while each 0 is a bit where the original value is to be cleared. After performing an AND on each bit pair, the first three and last three bits are preserved while the middle six, since they were each ANDed with 0, are forced to 0 in the output. We can also look at this clearing function a different way. We are clearing the bits where the mask is a zero, and in so doing selecting the bits where the mask is a one. Thus, ANDing with a bit mask means that you keep the bits where the mask is a one and remove the bits where it is a zero.